https://jakerlund.net/003/8 …, tick to Search page, type in Strapline, the homepage is found with the search term. Cool. @Jakerlund how did you do it? @mackyangeles I’ll put something together and PM you a link. As usual it’s a lot of steps and a file you’ll need to manually edit to get this to work. In this example I’ve focused on the live search which only works on a server. There is a Static mode as well that will work even locally. @mackyangeles A written tutorial is now available here. “Add custom code to Head and Body,” in Page Settings. Hopefully @Norm can add this as a Brick hehehe thank you so much @Jakerlund!!! Best Forum ever. Love the communtiy. @mackyangeles Btw… the navigation on the search page seems to wide. The menu gets clipped when the browser is at an unfortunate width. Edit 2: Seem like the class .bloc has a 50px padding on the left/right. Adding a class named bloc and give it padding left/right 0px fixes that clipping, but maybe cause something else to misbehave. @mackyangeles It behaves like that in Safari, Firefox and Chrome. It’s when we go wider than the 1199px breakpoint. It even shows in Blocs when draggin in the window. Dragging it inside the 1199px point and it looks as it should again. It’s not a biggie but we can’t control how wide a user has his browser. @Jakerlund I think that breakpoint is very unusual and I think for now Blocs doesn’t support that breakpoint. Maybe that’s why where having this glitch on some point. hehe. @mackyangeles That breakpoint is in the bootstrap.min.css. 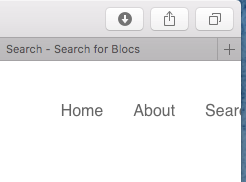 I’m wondering if the class .bloc in the style.css is meant to have that 50px left/right padding. At least for widths over 1199px. Again… it’s not a problem, more an interesting issue that may happen to users going to your site. I’m not comfortable with nor find the time after finding some new code I’d like to insert in my webpages, so I haven’t used this function in Page Settings. I’m still familiarizing meself with Blocsapp now. 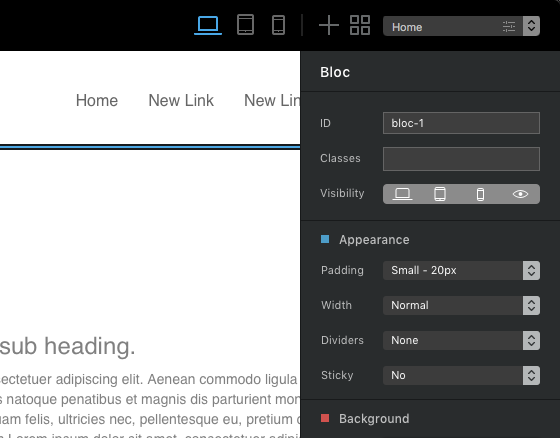 I’m glad I purchased the Blocsapp. It’s speeding up my new website creation to be more what I want, instead of a template somewhere. T’anks for the reply, and good day.